I was running ConfigMgr 1511 from an upgraded System Center 2012 Configuration Manager R2 SP1 Infrastructure with configured Intune Subscription without a problem for more than a month. But due to my Azure Tenant Name selection more than two years ago, I wanted to change the Tenant name from uncoolname.onmicrosoft.com to hosebei.onmicrosoft.com, because you might already guess it: the SharePoint URL. Exchange Hybrid and all other Services was not easy, but worked how I planned to do it. But unfortunately the Service Connector did not work after this change, even after changing the Intune Subscription to my new Tenant. Certmgr has not installed certificate yet, sleep for 1 minutes. ERROR: ERROR: Exception occured while calling REST UserAuth Location service The Dmp Connector failed to read the connector certificate. As outlined in this TechNet Forums post Link, the registration of the DLL will success with another .Net Version and it is also visible within the Logfile two Lines below the error. The Site System Installation Account is used by the distribution manager on the site server to transfer updates from the service connection point. The synchronization afterwards was working like before. Hey buddy, I’m missing the SC_Online_Issuning certificate. I’m guessing this is causing my issues with the error: The remote server returned an error: (401) Unauthorized. Removing the Intune Subscription from Configuration Manager may cause the need to un-enrol and re-enrol all of your devices. That’s bad. 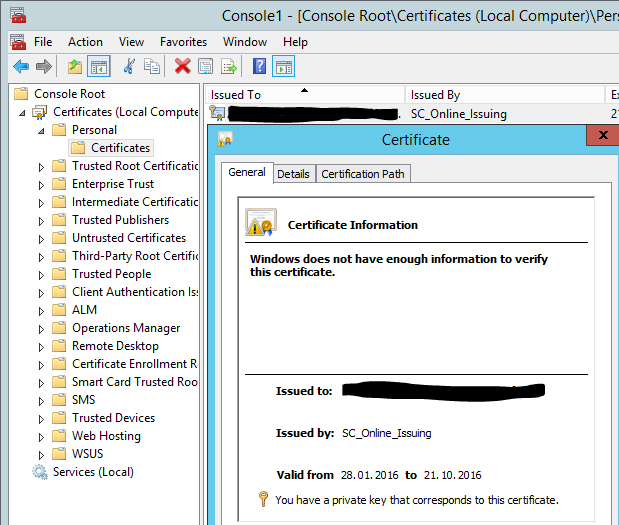 If your having certificate related issues with the Intune integration, we suggest you raise a support ticket. All Intune related support cases are FREE, so it’s best to just raise a case rather than risking it. thank you for your feedback. This is actually true, I did had good experiences using the Intune Support within the Office365 Portal. Thank you. Removing the Service Connector and reinstalling it fixed it for me. Downloads are showing up now.